Oh, the colour, the spirit, of India! Honestly, the sort of things I got away with in India would be impossible in Europe; and trust me, I’ve tried to crash weddings in England… and failed. Bangalore is a city of colours and flavours, and I was keen to taste as much as I could. 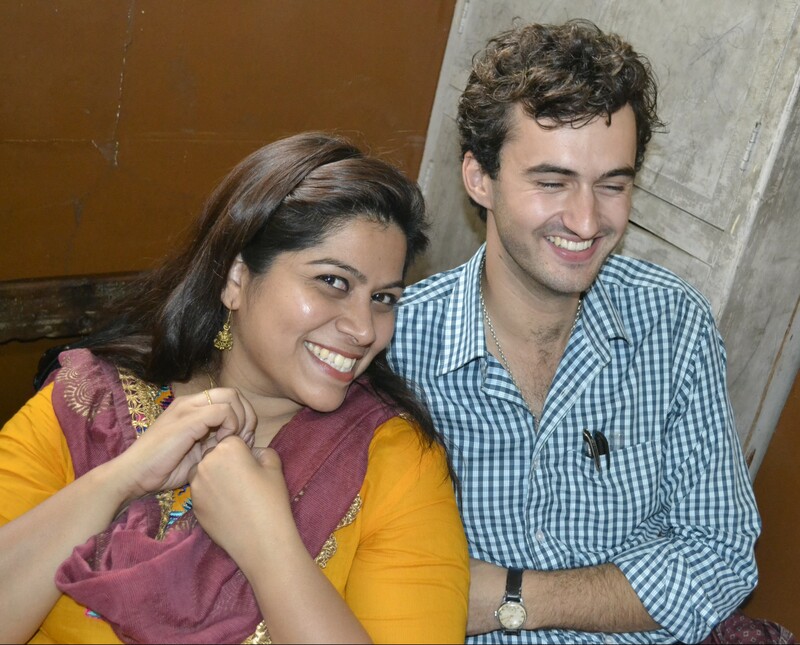 I made many good friends during my time in India; Minu was one of them. darting through the traffic and wonderful chaos of this great, historic Indian city. to not only see behind the veils of tourism, but also ensure you don’t get ripped off! – fascinated by your stories of travel, life; and home – the Western world. Minu and I, in a state school in Bangalore. happy to cater to the whims of an aesthete (not always so easy, I assure you). We went to the Bull Temple. The statue of the Bull was enormous! The idols all around the temple building were stunning, awe-inspiring, littering every available space, baring down upon the viewer below much in the same way the enormous statues of St. Peter’s in the Vatican do, another place that is full of so many earthly riches… I took my shoes off, and climbed up into the pillared hall whilst the priest wasn’t paying attention. I took a moment to sit against the cold stone, to reflect on my journey, and to just be thankful for everything this global pilgrimage has brought me this far – all the faces, places, tokens given of heart. A silence much more holy than the blessing.. Some really beautiful gardens surrounded the temple, a very peaceful, simple place. I much enjoyed watching the other temples goers, coming in for blessings, sitting around under the sacred banyan trees which were just so beautiful I had to touch every single one I saw. Of course, no matter where you are, whether Christian, Muslim, Hindu, Pagan, Druid etc. giving thanks… no matter whether it’s by sea, tree, in church, temple or under mountain: the Voice speaks. We were just leaving the temple complex when this little tiny puppy came running out of no-where, right up to me, jumped straight into my arms. Gorgeous little tike! If I stayed in Bangalore longer I would have no doubt kept it. I couldn’t bare to see it running around by the edge of the busy roads… Reminded me so much of my time in Agii Apostoli, Greece. Another soul met on the journey. 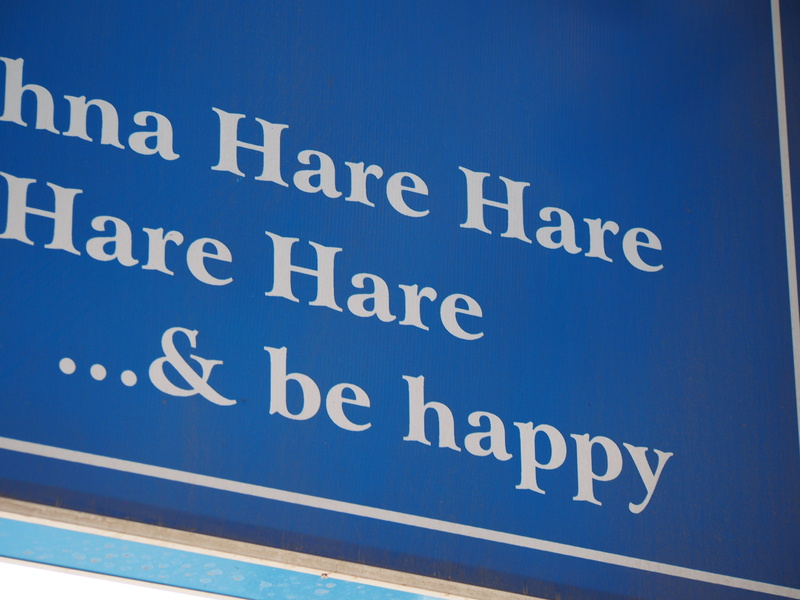 Minu took me to the most fascinating bazaar – the Gandhi Bazaar. 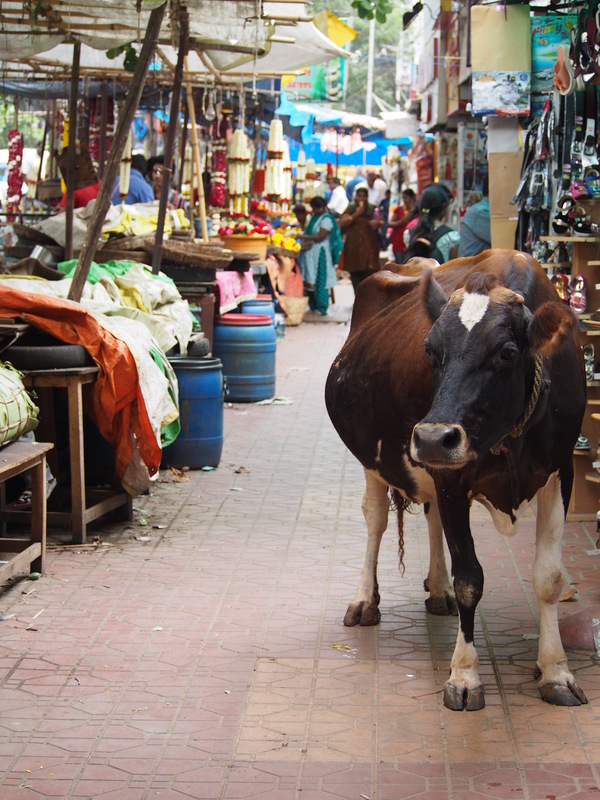 A huge cow was wandering round the bazaar too – probably trying to find food. The locals kept slapping it, or shouting at it which made me quickly indignant, and so I helped guide it back to the road ~ where it belonged (might sound crazy but cows spend their lives wandering up and down highways and road sides in Indian cities – one of many unsaid rules). I don’t judge, however, life is much harder for these people than for me – most of the locals cannot afford to be feeding somebody else’s cow… but I’m not a local. We went for a traditional Indian “thali” on one of the many occasions I got hungry during our times wandering the streets of Bangalore. There are plenty of excuses to get hungry in India… thali is one of them. Don’t be afraid to ask for seconds… or thirds. Probably my favourite temple we visited was along the Kanakapura Road, in Basavanagudi. A modest temple, simple in design, with a huge courtyard set in the middle. It was the use of the natural elements around that really enchanted me. 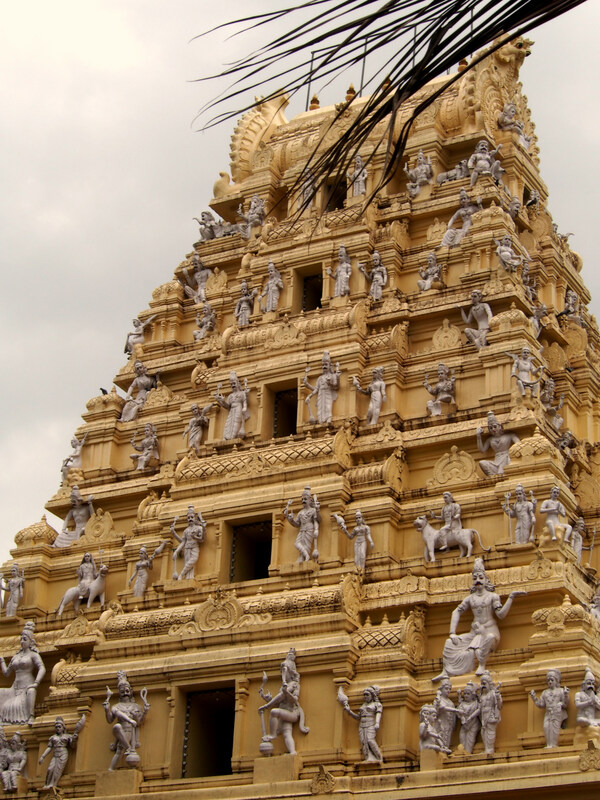 Hindu Temple, Bangalore, India 2015. 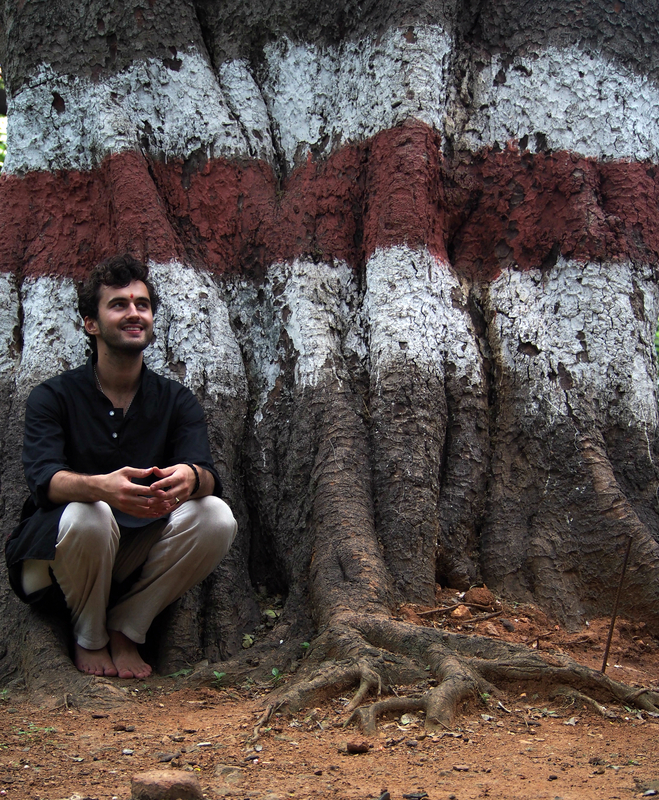 Round by the side of the temple, down some steps, I found a couple of Banyan trees – वट वृक्ष – aalada mara in Kannada, the language of Karnataka and Bangalore – the trees sacred to Hindus, and among the largest trees in the world. EVERY tree is holy to me – and my time spent walking barefoot under these sacred banyans and the little shrines around them is simply unforgettable. Feeling their aged bark, their great roots beneath my feet, trying to sense the magnetic energy between them. This is LIVING, people. And it didn’t cost a thing! I didn’t need a tour-guide, map, TripAdvisor, or an iPhone to tell me how to smile and enjoy this moment. I wouldn’t trade this for a selfie by the Taj. I cannot get the image of her ‘Mona Lisa’ smile out of my head to this day. I just felt like she knew something, she could see something. It was a kind, but a knowing smile. Perhaps it was an age thing, her old and I young? Perhaps we the wisdom I admired in her face was the youth she admired in mine? Or perhaps she had simply never had her photo taken by a Westerner before, found it novel, or was humbled? Whatever it is, it will surely stay with me. 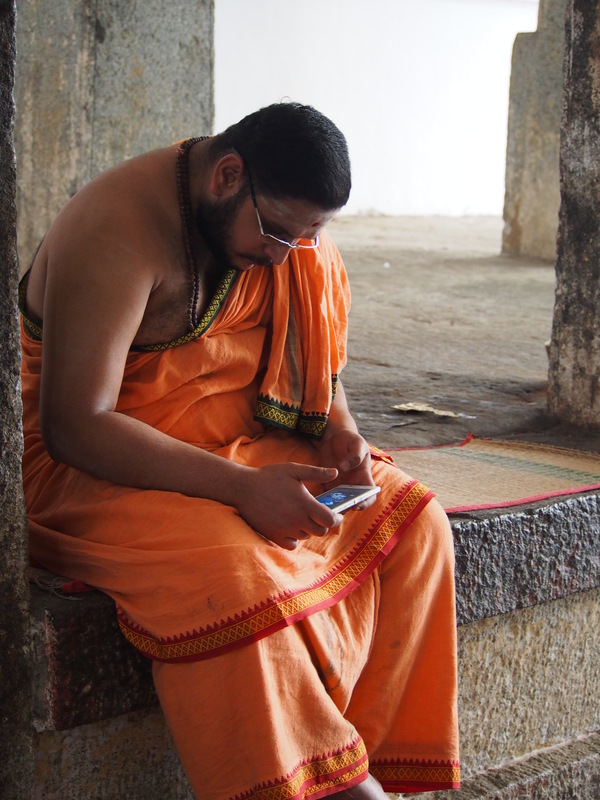 Directly opposite the temple, across the busy road, you’ll find Basava Ambara. 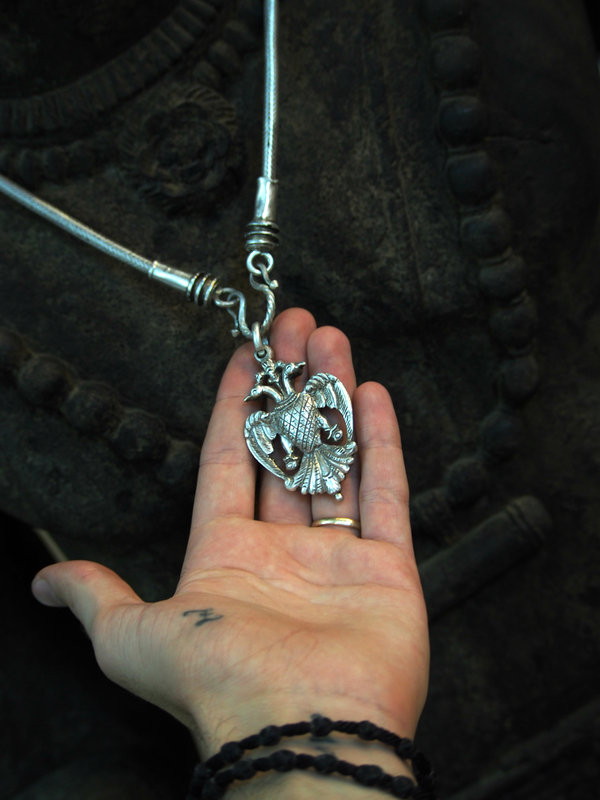 I was particularly taken with this pendant, and asked to try it on. Unfortunately the shop keeper couldn’t undo it; she was straggling away to get it apart and I thought she might break it so I asked her to leave it. Alas… again, I walk away with no earthly treasures. 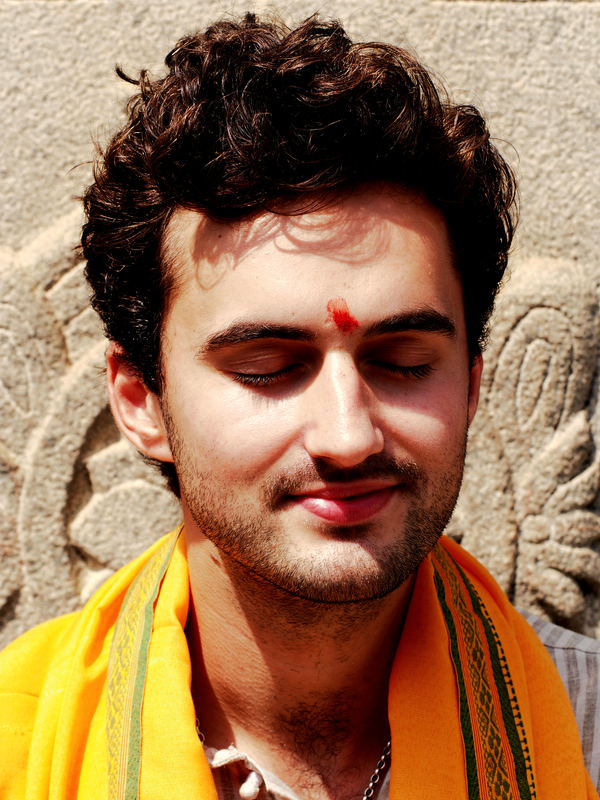 We walked around, Minu bought me a nice orange scarf from the temple shop – a sacred cloth that I still carry. 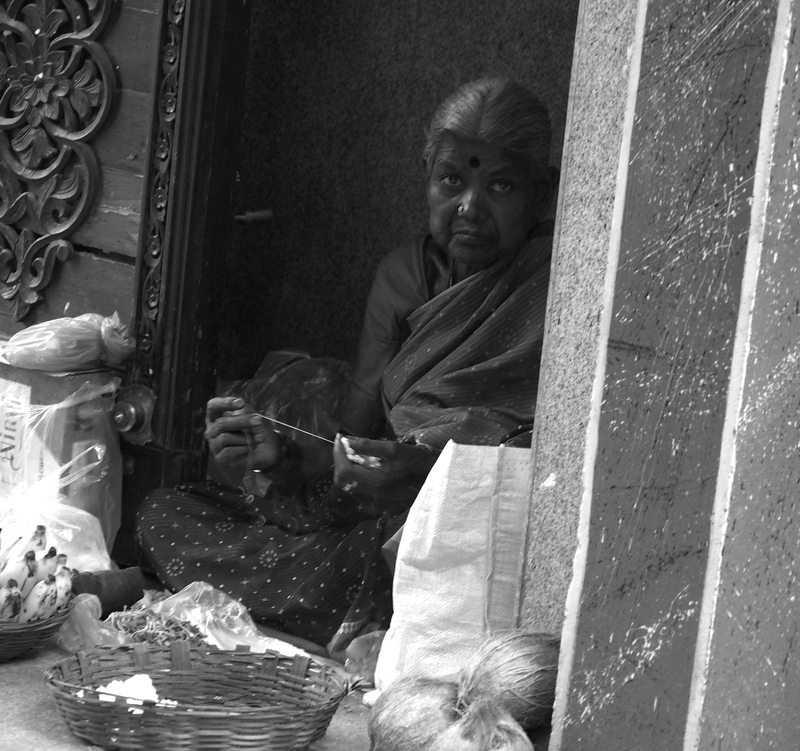 We crossed over the road where I’d spotted yet another temple (Minu sighed) and sat outside, not really sure what to do. I sat with my back against this stone obelisk. The temple was shut and we couldn’t find a way in. I spotted what I thought was another entrance and sent Minu to investigate. “There’s a wedding going on,” she came back saying. My heart sunk – another closed door then… “They said we can join in” she finished. What!?! We walked down some steps into this huge space beneath the temple – there were people everywhere – all the colours and sounds you’d expect from a Hindu wedding. Immediately an elderly man came through the crowds and approached us, explained he was the father of the bride. He seemed delighted to shake my hand. I was delighted to shake his! He took my bag and showed me to a seat – wouldn’t let me carry or do a thing – he kept saying how much of an honour it was that we’d turned up, and how important it was to welcome me, this guest, from the other side of the world. Well, as you can imagine, I was rather blown away by the reception. He kept bringing over various members of his family – his rather ancient and beautifully dressed mother for one – over to meet me. Everybody was shaking my hand, giving me little gifts, thanking me for showing up. I felt like I was in some magical dream! 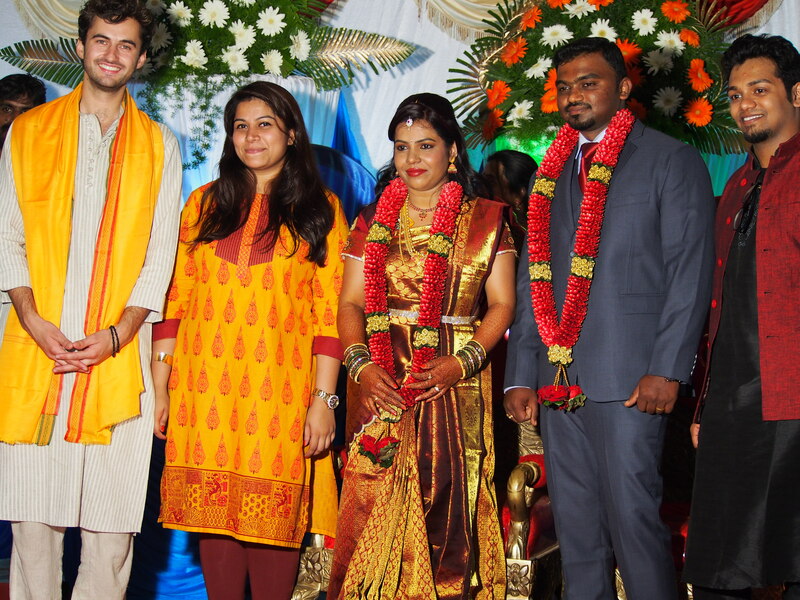 Next minute someone planted a dot of red powder on my head, and Minu and I were walking on stage, ready to get a photo with the bride and groom. They clearly had no idea who we were but smiled anyway! Then, after being introduced to more happy relatives, I was lead downstairs to the dining hall. We all sat down on long tables, and a load of semi-naked men came round, putting little handfuls of different foods onto these huge banana leaves. Of course, I was starving, so tucked straight in, eating with my hands like everybody else. Didn’t have a clue what half of the food was, but ate it all anyway. More and more food came, more and more relatives came to be introduced to me – I smiled so much and shook so many hands I was starting to get profound jaw and wrist ache. But, gosh it was a wonderful ache! This is but one of many times I was shown the true colour of the Indian Spirit – and what a spirited people! 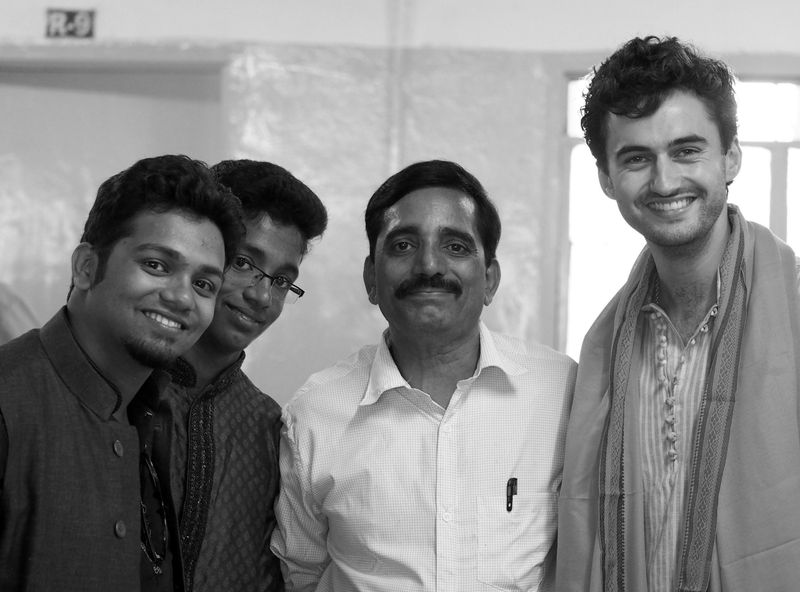 Here I am with the father of the bride, and his sons – one of the family! I became their brother and son for the day – and to say I was honoured really would be an understatement. what can I say? you really are the master of travels. hahahha. 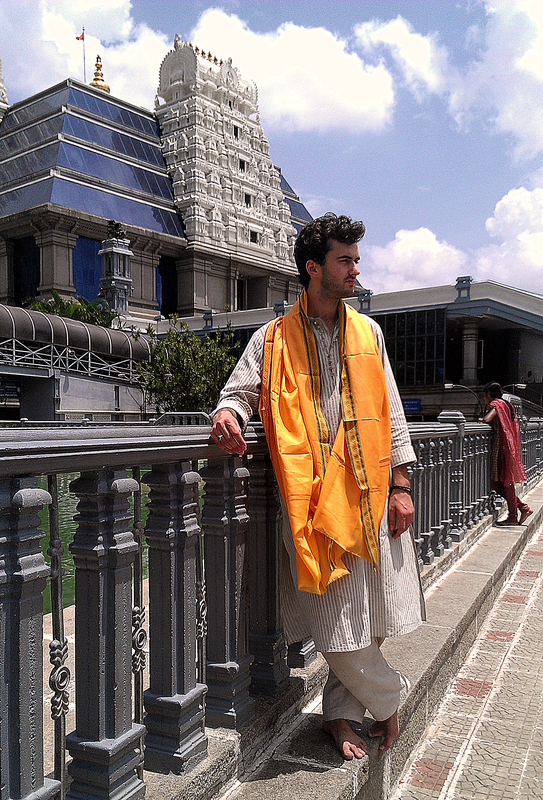 Oh India… what a place! So much inspiration for me there. Thank you, very much! That is such a compliment from someone who lives in Bangalore. I hope life is good for you out there… I miss the country. oh I live in the outskirts, so it’s much more peaceful there. It gives you the advantage of living in the city and the peace and quiet of the countryside. The only requirement is that you’ll need your own vehicle if you live that far out. Let me know if you are coming to this part of the world anytime. We’ll plan something. Yeah the centre’s pretty hectic. I remember it being a love/hate relationship. Loved it at first – the sheer amount of energy dancing around me, all hours. Such vivid manifestation of Life. After a month I was craving to leave, to find nature again… clean air. Found it in the jungle and rural regions. The pollution and having people all around you at all times will start to bug you if you have to live there on a permanent basis. Sure thing man. Let me know. Keep up the good work. I read a lot and travel very little, so I’ve been systematically reading all your blogs. Big fan of the Travel blogs. Thank you! I’m really flattered. simply amazing . Love this, thank you. So many memories. Where ever you are! god bless you – stay happy. this is beautiful. 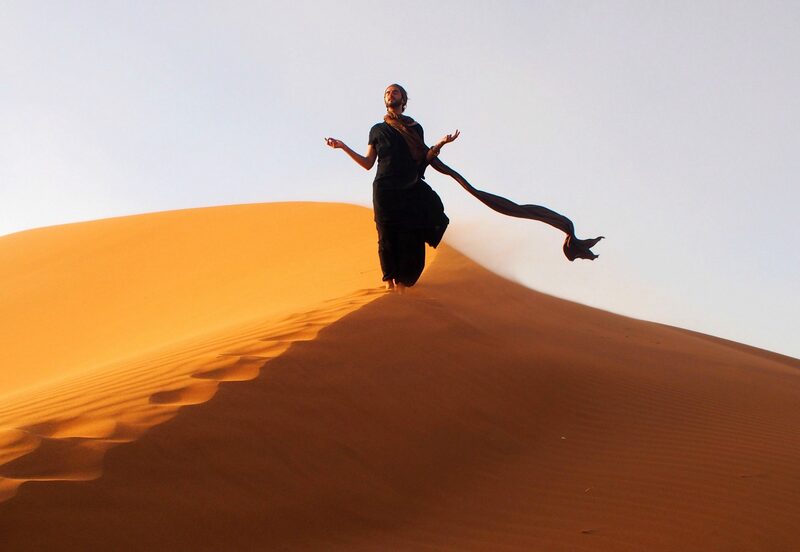 my heart is yearning to travel India. Thank you. I hope you make it! Bro! why no like button on your page? Took it off. Like buttons are great for a photo or whatever, but not for my soul. I put too much into this. What a lovely post, thank you for sharing your day with us! How wonderful!! Love this story and the pics are amazing! 🙂 This makes me more happy than I can express! great post. Glad you liked my country and the ideology being followed. Have a great day. Cheers ! I like how you said, “Wherever you are, whoever you’re with, be happy.” Life blesses us with kindred spirits and it seems you found the same at this wedding. The colors speak of joy and happiness. I too have great happiness even after 35 years with the same partner. Once you find love, nurture it, polish it, believe in it. Thank you for sharing this inner part of your soul! A beautiful, heartfelt post. Glad you enjoyed your time in my country. A fantastic post. Beautiful photos and your words are a touching tribute. I stand inspired as always!! Since I come from India, it was heartening to read what you had to say of our brethren, and culture. The photos are gorgeous and it added so much colour and charm to the lovely city of Bangalore. Keep writing. What you say, truly has a lot of soul. Yes they are! Always… Thank you. Means a lot.